Seminar paper from the year 2003 in the subject American Studies - Culture and Applied Geography, printed single-sided, grade: 1, University of Hamburg (Kunstgeschichtliches Institut), course: Hauptseminar, 15 entries in the bibliography, language: English, abstract: "If I perish, don't let my paintings die, exhibit them " While speaking these words in his Belgian exile in 1942, Felix Nussbaum did not know that he had only two more years to live until the terror regime of National-Socialism would murder him and his wife, Felka Platek, in Auschwitz. Being only forty years of age when murdered, the artist seemed to have abandoned all hope after being forced to live in exile and under constant threat of discovery since 1933. Nevertheless, this personal hopelessness did not include the destiny of his artwork, for which Felix Nussbaum cared as long as possible. "The unpainted paintings of Felix Nussbaum demand nothing less than to become visible to the contemplating eye" and so Daniel Libeskind built a museum in Osnabr ck to house the largest collection of Nussbaum's paintings as well as to create "a profound place for the encounter of the future and the past and not only a testament to an impossible fate." In July 1998, 54 years after Felix Nussbaum's deportation to Auschwitz, the museum opened its gates to the public. "The Museum without an Exit," as Daniel Libeskind coined his building, challenges the traditional idea of museums as "Temples of Contemplation." Libeskind insists on emotional and physical experiences evoked when entering the museum's space. His difficult building does not allow visitors to be passive spectators, since the museum does not simply offer space for distributing works of art. 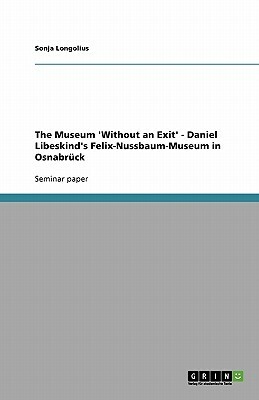 Rather, Libeskind's building urges people to get closer to the experience of Felix Nussbaum and hence sets new standards in regard of museum-building.